Made it today on a whim, again. Fantabulous as always. No panchetta, used bacon, not a problem still awesome. Bacon here as well, so hope it will go well. Must try panchetta some time, also minced steak. Ragu recipe is absolutely the best ever. Felt strange putting milk in. Made double quantity only problem is I keep popping into kitchen and having another spoonful. So, so good. Anyone have any experiences with using pressure cookers? How would you adjust the timing etc. I have used the pressure cooker once for the ragu, including adding milk and it seemed to have worked out fine. Cuisine is corrupted by time and distance. My home country is Britain and we have much to scorn and much to love in our perversions of foreign cuisine. I qualify at the outset that the stereotype of food in Britain being crap is as useful an indicator as saying that all Spanish people enjoy throwing Donkeys from clifftops. My interpretation of a Bologna ragu calls for more sauce so the trinity of celery, carrot and onion has a greater ratio, I am not made of money. I ask my local butcher to keep aside the tailings from when he has run skirt, chuck or short rib through his machine and put them to freeze for me (I live alone) and I keep a stock of those beef cuts for burger and sauce recipes. I use a generous pound (500g or so) of beef and one or two carrots depending on size. I use smaller onions, they have less woody hearts to cut out, two usually does it. Two sticks of celery, utilising only the tender two thirds. Pork belly works well to fry the soffritto but gives off too much water causing boiling rather than a sauté in the pan. If you can find a butcher who salts and dry ages belly pork that is what you want whether he calls it Pancetta or not. A salt cure and dry age of belly pork without pepper or other frippery is the one to have. I sauté the soffritto and in another pan fry the beef in the minimum of olive oil. I fry it hard and keep it slowly moving, any steam and it is not hot enough, the Maillard reaction works in compound sauce dishes as it does in roasts. Contention within my cooking friends occurs at the point of when wine is introduced. I add wine to the soffritto in several pours and reduce each time. I am generous compared to the approved recipe and add 20cl to the mixture. I add the browned beef when the last of the reducing wine is losing its acidity. I don’t finish mine on a hob top as I am busy, I place it in a casserole/dutch oven then in an oven set for 150c for about 2 1/2 hours. I add beef or chicken stock a little over an hour and stir down the dried juices into the mix. I use a paste that is a pain to track down, San Marzano tomato. I grow San Marzano some years and they have everything I want in a cooking tomato. Sometime I mean to do a reduction on my occasional crop and bottle the paste but its all work. For me the reduction and cooking time is complete when if I cleave the sauce with a wooden spoon the mix stays parted for a minute or more even when hot. As to what shape of pasta to use I would say anything but 1/8″ when cooked spaghetti. I sense some snobbery from fellow cooks about using ribbon pasta designated to half millimetres. Any quality dried pasta in stick form, Linguine, Fettuccine, tag. All wheat, egg and wheat, spiral, tube as long as it has enough surface area and or pockets to pick up the sauce. Fresh or home made is nice but dried pasta extruded through a bronze die is good for all. The bronze die product has a courser surface texture and the liquid component of the sauce adheres to it. I don’t use milk, there are lots of places for a prolonged discourse on the use of milk in Italian sauces and indeed Indian curries but I don’t bother. Hello Ian, I have just read your contribution to the subject of the ragu bolognese. I really admire your passion and honesty about how you cook. Some may call it pedantic and maybe it is but it pleases me to see that someone is prepared to cook properly compared to the corner cutting that goes on based on ignorance and laziness. I shall take your methods onboard. Thank you so much for this great recipe. Since visiting Bologna last year and trying an authentic Tagliatelle al ragu (no mention of Bolognese on the menu), I’ve been hankering to try my own. Alright, after several trials, I am able to produce decent Ragu consistently. Since pancetta (or unsmoked bacon) is impossible to find at where I live, I substitute half of the beef with ground pork. I also diverted slightly from the Academy’s recipe by adopting Marcella Hazan’s technique, which involves adding then reducing milk first before wine. Another key element is the GELATIN rich homemade chicken stock made out of mirepoix, parsley and chicken feet. 25 gram of tomato paste (triple concentrated) is diluted or combined with a liquid cup of stock. This concoction is the final liquid to be reduced. Each liquid reduction (milk, wine, and then tomato paste + stock) has to be done in a very strict manner. Don’t proceed to the next step before the previous liquid turns syrupy thick. Overall, it takes 3 hours from start to finish (not counting prep time). Worth it. I can’t wait to share this on my blog!! It sounds wonderful — just like my mamma used to make. Unfortunately she never had a recipe. Will definitely link back here. Grazie per la ricetta!! A long time I was looking for a good recipe for Ragu alla Bolognese. I mean I found it! I have to try it at the earliest opportunity. But will be very hard to find good raw materials in country where is cooked spaghetti carbonara with cream in all restaurants and is usually served a beer with an italian meal (yes, I mean Czech republic). What is better to use – red or white wine? And dry or slightly sweet? I lived in the Czech Republic for many years, and it was becoming much easier to find ingredients. Czech made “parmesan”, Gran Morava, is even sold here in Italy. They don’t tell people it’s Czech though 🙂 Don’t use Czech pasta though, it’s horrible! You can use either red or white wine for ragù. Italians will argue about what’s best, but use whichever you prefer. I use white. It should be fairly dry though, and good quality. If you would prefer not to drink it, don’t cook with it. The very same article that you quoted, my reference was to the fact that a wine that necessarily may taste bad to the palate may work fine for dishes. Hmm, I’m not convinced. If the wine is not of a quality you would drink, you won’t like the flavour in a dish. I think that when he mentions good quality he is not talking about Batard Montrachet or Charmes Chambertin. I think he means something that handed to you in a glass would not feel like an insult from your host. Indeed. Because you are simmering this for hours, thereby reducing the liquid, you are concentrating the flavours. If you don’t like the flavour before concentration, you will hate it once it has been concentrated. Dry wine, red or white makes no difference as long as it is not flavoured by oak. White makes for a better colour on the plate. Red wine makes for a dark looking sauce. Rosé works well if it is a robust version. Great recipe! Very flavoursome and meaty flavours. The only problem I find with this recipe is that the quantities are a stretch to feed two! For a family of 4 (And we have only above average appetites :P) I’d recommend doubling this just in case. Anything that’s left you can freeze or have the next day anyway. Thanks anyway! I love converting people to a proper beef ragu. Thanks Nathan. For a typical portion of pasta with ragù eaten outside of Italy you are probably right. This recipe is for Italian quantities. Outside of Italy we tend to use much more sauce. For the Italians, the pasta is the most important thing, and they say if you put too much ragù on it, you can’t appreciate it properly. Interesting. Not one herb. Thanks for the recipe. Found your recipe after having a good search on the net. Followed it to the letter (but made x3 the amount – if I was going to cook something for 4+ hours I was going to be sure to make a big batch!). What a revelation. Meaty, thick, packed with flavour. Had it with penne the first night, tagliatelle the 2nd. Really enjoyed it the 2nd time, ala true Bolognan style. Just a few tips as I’m actually currently cooking it the 2nd time right now – the pancetta adds a lot of saltiness to it; I found I didn’t need much at all. And did have to add a bit more milk to it at the 4+ hour mark as it was drying out a bit and catching at the bottom of the dish. May true it with half milk/half stock to try something different. Yes Derrick I’m always amazed how much it can absorb more and more milk. But that just seems to make it meatier and meatier! Cast some beef or chicken stock into it when it has reduced to leave 1 to 1 1/2″ of rings in the pot, depending on how big the mix is and how deep the pan is. You will know how much to add when you take the lid off. Scrape down the caramelised sauce as you go. All is good when adding liquid to a sauce during the cooking time. I can’t thank you enough for posting this recipe, I’ve literally been searching for it over 20 years. The miracles of the internet never cease to amaze me. II just joined your interesting “Bog” – tried printing and e-mailing a recipe – the page indicates “loading” but was unsuccessful ? When your mother is speechless, you know, that you have succeeded. Thanks a lot for the recipe! Her dentures was glued together. Hi I think a lot of people missed the point. An authentic ragu Bolognese isn’t about making necessarily the most delicious sauce ever, it is about experiencing what (some of) the people in Bologna know as their own sauce. Don’t get me wrong, this recipe is one of my favourites. But there can be others without milk and with garlic and herbs but they are just not an authentic Bolognese sauce. In the same way a Thai curry and an Indian curry can both be delicious but they are different. I love this sauce and my kids don’t complain so that’s the real bonus! A little secret from a good friend from Bologna. Fry a chicken leg in olive oil. Set aside. In the rendered fat, subsitute the pancetta for a high quality and rich salsiccia. Instead of the tomato concentrate, use seeded and purees San Marzano tomatoes. Then carry on with the recipe adding the chicken leg. As the ragu simmers and the chicken leg cooks, fish out the skin and bones from the chicken leg. Use cream instead of milk. Spend more time simmering down the Ragu at low heat with a large dose of patience and you will be rewarded with a Ragu that will impress the purist…. My 2nd attempt yielded much better result. I employed a heavy bottom stainless steel skillet this time, and no more scorching occurred on the bottom of the pan. I simmered the ragu for about 3 hours, and the result was fantastic. I will try adding a pinch of nutmeg like Marcela Hazan’s version next time to see if the flavor can be improved further. I used a stainless steel small saucepan since the enameled pot was occupied by another food. I guess it was a mistake to utilize the said equipment because uneven stirring caused a few scorching burn mark on the bottom of the pan. As the result, I didn’t let it simmer long enough (less than an hour) to develop the flavor. I believe cast iron or non-stick might be more suitable to make this ragu. It was also impossible to find pancetta in predominant non-pork-eating population (Indonesia), so I had to use streaky bacon as the substitute. Another mistake that I made was the mincing process. I believe that I didn’t mince the vegetables fine enough. Next time, I would employ food processor to do the job. Same problem also happened with the beef & the bacon. It was regretful that the meat department where I bought the meat didn’t posses any grinder, which was ridiculous. I’d do better next time. It was so disappointing when the ragu tasted bland; the meat was still stringy & chunky. I think that’s probably the biggest compliment my cooking has ever got! Excellent find for me. I have been looking for recipes using skirt steak and am getting tired of asian type dishes, but they are a bit fast and furious. This is easy peasy and totally delicious. No work at all, just time. I’ve tried it a few times now and I think the next time I shall have to try making my own fresh pasta. It’s not as if one is ever rushed making this ragu. Skirt steak is the meat for this, it gives the most wonderful flavour. I make my ragu with water instead of milk. I’m very curious to try it your way.. I got my recipe from my Italian teacher, his family is from Bologna. Love this, so glad I found your site. After traveling to Italy last year, my husband and I are having great fun bringing Italy to our home. Homemade pasta was the BEST skill we brought home. Now we are having a blast with sauces. I am struggling with the same issue as several others regarding Tomato puree. I see your link to https://culinariaitalia.wordpress.com/ingredients-explained/tomato-products/ but cannot read the labels. In the my city/country, the “paste” is thick enough to stand up on its own if you were to remove the top, bottom and sides from the can (very thick). “puree” is definitely a liquid consistency, you can pour it. Any comments? PS I settled on paste. Thanks folks. I’m glad you like it. I’ve made this recipe five or six times over the past year. It has come out really well every time. It’s a true classic and the family love it, including my 18-month old son. I think one key to it is getting the best pasta you can – ideally homemade if you have the time. Pork lardons work well as a substitute if you can’t get decent pancetta. Thanks so much posting the recipe. Hi Chris- we all went to Italy separately this year and my family has taken this recipe on with gusto! Its absolutely delicious and we’re even featuring it on our Christmas Even Menu. What an amazing site! I made this ragu last night and received nothing but praise. As a lover of Italian food I often am frustrated by the substandard recipes online. This blog has given me plenty of inspiration and I will continue to try other recipes posted here! Thankyou for this. I finally got around to updating the picture of the finished dish. I was very English in the way I served it. This pic is much more representative of how it should be served. I just wanted to mention to the article’s author, that flank and skirt steaks are two different cuts of meat. I first used the flank steak as suggested. This is a real wonderful recipe I would recommend to anyone who is interested in understanding the basics of northern Italian cuisine. Thanks for sharing it. Pingback: Semi-Authentic Bolognese Ragu | eat. drink. cook. travel. No basil? No oregano? No garlic? No parsley? Why so bland? Yes. This is an Italian recipe, not an “Italian” American one. I can assure you it is not bland. Thank you again for standing up to my American compatriots who want to leap to conclusions without getting the point of sophisticated TRADITIONAL Italian cuisine. Just try this recipe faithfully, reserve judgment and you may experience a major culinary epiphany!!! And go ahead, if it’s your desire, smoke a cigarette after. What makes Italian food so elegant, is the simplicity and interaction of it’s ingredients. Too many ingredients complicate the delicate balance. I lived in Bologna for a year and ate tagliatelli a ragu at least once a week. They don’t add any spices or garlic to the ragu, but the depth of flavor the ingredients take on after two hours of cooking is indescribably amazing. In fact, when asking a bolognese native whether they added garlic to the sauce, because it’s so flavorful, he almost had a heart attack. I also watch out for the amount of salt I use in the beginning, especially with the pancetta or proscuitto because of how concentrated the sauce gets. Ha ha. I think that is a safe assumption. I think some people miss the point of this sauce, it is somewhat unique for Italian sauces, and that is part of what makes it so special. Adding garlic or herbs would be heresy. Actually, true Alfredo sauce has no garlic either, just butter and Parmesan. And yes, carbonara sauce should not contain garlic or herbs either. Although being from a Southern Italian family(Napoli), I put just a very small bit of garlic in my Alfredo, about half of a small clove or one tiny clove, and of course, *freshly* minced parsley on top. This recipe is excellent for its simplicity. In the end, isn’t the point of a dish like this supposed to be about using what’s on hand? I think it is. If you want to use bacon I say do it. If you want to swap in US style tomato paste for the puree, go to town!. Change the proportion of carrots to celery, or vice versa? You have my blessing (which is worth exactly what you paid for it). Recipes are guidelines, not gospel (unless you are baking. Baking is science–cooking is art). If you’ve prepared a dish more than twice and haven’t varied something you aren’t cooking. You’d save time by buying boxed dinners and following the directions exactly. This isn’t to discourage those posters above who have obsessed somewhat about ingredients. It’s to encourage them to stop it, and give stuff a try. i understand the concept of a certified authentic recipe. I don’t think any less of anyone who follows this one to the letter. But when I started chopping vegetables today in order to make this dish for the zillionth time since I discovered it here I didn’t realize I had no olive oil (I used butter to saute the veg instead). I knew already that I had no pancetta and although I could easily get it at any large Supermarket here on the west coast of the US I find that regular supermarket bacon or a combo of bacon and supermarket ham works ok. I honestly don’t think I could tell the difference in a blind taste test. The first time I made ragu alla bolognese I used this recipe exactly as written, right down to the tagiatelle. I’ve never done that since, and I probably never will. Tonights offering will have the substitutions listed above and it will be served with penne rigate because fresh tagliatelle is a pain. I’m an equal opportunity adulterator. My cornish pasties use butter instead of lard, my red beans and rice will often use something other than andouille and sometimes will substitute green chilies for some of the green peppers. I make reno red chili with a spoonful of cocoa powder added in the last 10 min of simmering just to give it a undefinable layer of underneath flavor. You do not want to know what I do with my coq au vin. But damn it tastes good. The common thread is that all these dishes are everyday food. Peasant food if you like. They evolved from cooks using what was on hand. There is nothing wrong with Italian culinary authorities certifying that this recipe is THE one for this dish. There is something wrong with not cooking it because you’re short an ingredient. It’ll still be great! Nothing sexual I hope. You make a good point though. I put a very small bit of garlic in my alfredo sauce and also a very small bit of cream. Traditionally it is an all butter sauce with no garlic, but I just prefer it the way I make it. So shoot me. Actually I WOULD like to hear what you do with your coq au vin! This recipe is really an eye opener for me. But where I come from, pancetta isn’t readily available. Can I use bacon as a substitute? Yes you can. Minced pork will work well too. I live in India where some of the ingredients for Italian cooking are not readily available. My ragu so far has required me to cheat and add a couple of spoons of ready-made sauce from a jar. Now for the first time I feel encouraged to try this recipe. However can I use penne or fusili instead of tagliatele, as the latter is difficult to source. Also instead of pancetta, I plan to use local bacon minced fine. Penne (rigate) or fusilli would probably hold the sauce quite well. Also if the bacon is good quality it should be fine. Good luck. I can taste the recipe as it is being read. Thank you! Also, I encourage all chefs to cook boldly and to inadvertently make mistakes as nothing can educate you more quickly. My poor wife has been over peppered by my heavy hand and also the lucky recipient of of heaven on a plate. My approach is to just dice away, some proportional quantity (as opposed to measuring) and place it in there, allow your sight and your olfactory senses to guide you. Many times I add a little more of something as I watch the ingredients coming together. You will be richly rewarded. Made this recently while introducing my girlfriend to proper Italian food, as opposed to the sad travesties served in most Japanese Italian restaurants. Absolutely phenomenal. Thanks for a great recipe! First i would like to say thank you for a brilliant recipe and second could you please put up a recipe for naples ragu as i am sick of the terrible food served under pretense in the uk. I’m making this ragu with lasagna for a dinner party tonight. It appears spot on ingredients and technique wise, I’ll let you know how it turns out! Thanks for the authentic recipe. Made this Bolognese twice this month and it’s fantastic!!! I had to endure 3 of silly Delia Smith’s pages, then about another 4 before I landed on here. I still wouldn’t use milk in any meat recipe though, but then, cooking is all about one’s own tastes, not someone elses’. I always use garlic, but other than that, this is more or less the recipe I’ve been using for decades. I’ve read dozens and dozens of “authentic Italian ragu/bolognese recipes” over the years and I have yet to find 2 that are identical. As I said, it’s all a matter of taste. Same with “authentic” chilli recipes…but that’s another country altogether! Hi Sandra. You are quite right, cooking is all about one’s own tastes. This recipe is marked as authentic because it is the one registered at Accademia Italiana della Cucina. I am sure every family has its own though. I think the point of this sauce is to use good meat. This not your usual spag bol sauce where you throw in any old thing from the herb cupboard. I followed the recipe to the T. I used minced Veal (from Waitrose), Cirico Double Concentrated puree (I added an extra 10g as recipe suggest if you dont have treble concentrate), glass of White wine (Italian of course). I minced the pancetta in the food processor and diced the veg very finely. Cooked for 3.5 hours, served with Tagliatelli. It was superb….absolutely fantastic. Italain food is about simplicity and all these basic ingredients enhanced the meat perfectly. I was sceptical at first..no garlic, no herbs….but follow the recipie, get the best ingridients you can afford and it will be beautiful. I’m fine. Just about back to normal. A little slower now though. I believe that congrats are in order for the second baby. I’ll get all the news from H who is arriving in a couple of weeks. I made this last night and it was very good. I searched for a recipe because I had all of the ingredients in the fridge and they needed to be used up. I had a thin cut sirloin steak, hot Italian sausage, prosciutto, some half & half, sauvignon blanc, a very ripe tomato, tomato paste, and homemade beef stock. I hand chopped the steak into about a half inch dice and seasoned it with garlic & onion powders, salt, pepper. I removed the sausage from its casing and sauteed it after the prosciutto had crisped. I pretty much followed the recipe, but I did add some minced garlic, parsley and oregano. Gotta have it. Make sure you get a good caramelization on the mirepoix. This was really delicious and tasted even better the next day. What people have to understand is that Bolognese is a MEAT sauce, not a tomato sauce. The flavor of the meat is front and center, not tomatoes. Thanks for the excellent recipe. It is very authentic. interesting that your site comes up as the first site when one searches for Italian Ragout … front of all the famous cooking sites … good description, keep up the good work! The milk must be integrated into meat before adding the tomatoes and after the white/red wine. Also important is to add salt just when adding the meat. This contributes a lot, as the salt releases the juices from the meat, adding value the the finished product. Thanks a lot for your very flattering comment Rikki 🙂 I’m afraid I can’t claim credit for the recipe though, only the translation. A great recipe which I am cooking as we speak. I’ve substituted traditional bacon for the pancetta purely through availability issues, but I’m sure it’ll taste great; it certainly smells it! Tried this recipe at the weekend and it turned out fantastic! I had it with Conchiglie and it was delicious… Not sure if it is allowed to with this type of pasta but it holds the ragu very well. Thanks for this amazing recipe. I had never had this until a friend whipped some up for the children’s dinner and all the adults were jealous!! I have one question. What is triple concentrated puree and is it available in the US? I went to the market with your list above and the italian aisle had no such thing. We have a choice of either puree or paste, nothing says concentrated. In fact, some of the cans of puree say they contain concentrate and water, and some of the cans say not from concentrate. The paste just says tomatoes for the ingredients. My friend had used tomato paste in his recipe but like I said, it was whipped up using mostly leftovers for the children and I didn’t think to ask him if that was the “correct” ingredient. This recipe was an eye opener for me. I was unsure and checked with my Italian relative first, she consulted her cookbooks and then I went ahead, unsure of outcome. I didn’t want to waste all my expensive pancetta. I followed your recipe almost exactly, finely chopping everything with a super sharp knife..but added half quantity of milk supplemented with stock (sorry, wasn’t daring enough to add all)..and also added a little extra tomato puree on top of the triple concentrate. I did a triple batch – so I added 300gm tomato puree for 900gm mince. Well I have to say the recipe is exquisite. 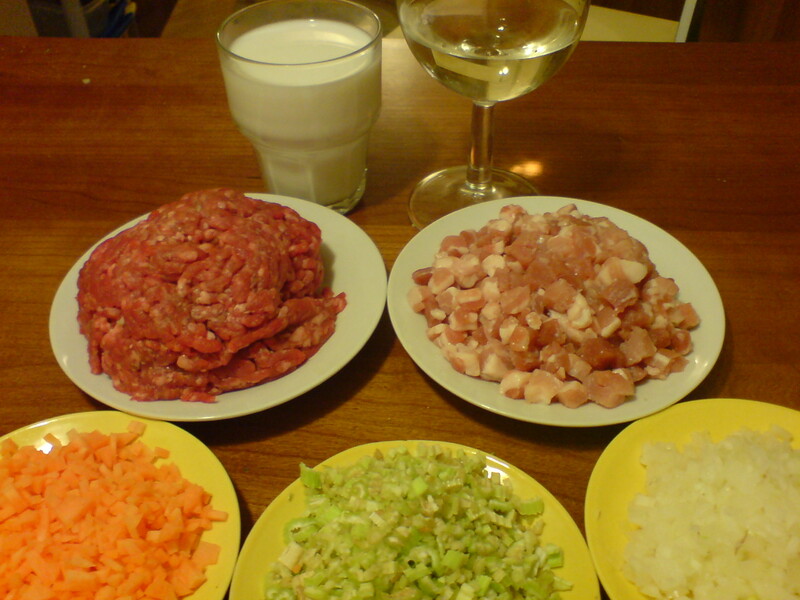 It was a completely different coking experience and a revelationb to me about the meat absorbing the wine and milk. I will never go back to the old, but I’m afraid now of being a snob. I make in triple batches and portion out serves for freezer, making a beautiful quick, mid week meal after work. Thanks Julie, glad you enjoyed it. I laughed at your comment regarding the near civil war. I am just glad you provided the “official” authentic (I know it’s redundant) recipe. Would you recommend buying flank steak and “mincing” it in the food processor, as opposed to buying ground beef? p.s. I understand from another blog that the Bolognese Chamber of Commerce has copyrighted a recipe nearly identical to this one. Thanks again. Thanks for dropping in. The really authentic way is to chop the meat by hand with a knife. That said, I’ve never met anyone here who still does it that way. I use the best quality minced/ground beef I can find. Probably the best way would be to use an old fashioned handcranked mincer, if you can find one and mince your own. I’d be very wary of using a food processor as it would be very easy to get the texture wrong and end up with paste. Yes, you’re right. This is the Chamber of commerce recipe. It’s wasn’t actually copyrighted, but declared to be the one official recipe (and probably nearly caused a civil war in the process 😉 ) See the first paragraph of the text. I made this today with a few variations. I had no celery so I added a bit of celery seed. I also used more tomato and subbed beer for the wine as I had no wine and am snowed in. The pancetta was pre-minced, and I hand minced the beef. Next time I’ll try making homemade pasta. This is an excellent recipe you’ve posted! Thanks for dropping in. I glad you enjoyed your meal. We don’t get nasty……..but beer in ragù !!!!!! I just got back from a one month stay in Bologna. Here is my report on how they serve it there. In case you want to make it similar to how they do there. First of all the color of the ragu was always orange. I never had a dark red one like that picture. I had the ragu at all the places famous for Bolognese cuisine like Diana’s, and Melloncello, and the Ragu was always orange in color. There was little to no tomato flavor at all. One thing I also noticed that was different from the picture is that the meat wasn’t finely ground in Bologna, there was always little chunks of ground meat as well. It is mostly a beefy flavor and the noodles would turn orange when mixed with the meat sauce. It was always served with either tagliatelle or lasgna verde. just a dollop in the middle. Oh and the pasta there is just so much better there. The fresh pasta is always a golden yellow. This comes from the fact that the eggs there have a dark orange color yolk, Also they add a lot of eggs to the pasta. The best pasta I had was at a place called Drogheria del Rossa, and the owner said he used 10 eggs per 1 kilo of flour. The texture was amazing. I never realized how could pasta could be, and it’s probably a reason why the sauces on pasta there just barely cover it, because they don’t like overwhelming the the pasta. They do serve the sauce just like you show in the picture though. Also I would assume if they were to use a red wine, it would be Sangiovese, its the local speciality along with Lambrusco. This is definately tasted authentic. I used flank steak instead, and used 3 tablespoons of double concentrate mixed with 3 tablespoons of water. Also I used 10 ounces of milk. I don’t know any cows so couldn’t get any fresh milk. I’m not sure how your’s turned out so red, mine wasn’t even close. It was more the color of the beef with a slighty orangish tone. One more tip, i think they chop the vegetables and panchetta so fine that they eventually melt, probably using a fine cheese grater or food processor, because I never saw bits of them in any of the ragu’s I had there. It sounds like you went to one of the few restaurants that still chops the meat by hand rather than use a mincer. This used to be the traditional way, but it’s becoming rarer nowadays. Totally agree about chopping the veg and pancetta finely. I can never be bothered to do it by hand. Finally – fresh milk lol. When I said fresh milk, I didn’t mean freshly squirted out of a cow 🙂 I mean not UHT or homogenised or other such abomination. Anyway, thanks for your comments. It sounds like you had a great time. thanks for the link on how to make pasta. I’m planning on trying to make some soon for a lasagna verde using the ragu. The lasagna is the best in Bologna. I love the fact that they don’t use ricotta or tomato sauce in it over there. I’m not sure if they mince the meat or just don’t break up the ground meat as much but here are two pictures of different ragu’s I took while there. I would be curious to know because it seems like you loose a ton of the fat from the meat in the grinding process. The first picture is from Melloncello, the second is the Lasagna Verde from Diana’s. One thing I noticed about the pasta there was that there was always little bumps or bubbles on the pasta which you can see in the picture. ha i know, I was joking about the milk. Bingo- excellente…..lol I am Italian American live in suberbs outdside of Philadelphia- my bolognese and my gravy (sauce to most others) is orange in color and most italians i know that are actually from Italy theirs is orange as well- it does depend on the tomato product you use and it also depends on the oil or oil based product (from the meat, etc) because that tends to oil it up and lessen the redness- the deeper color can sometimes come from meat or maybe even overcooking actually at too high a flame- i am not suggesting lesson the time at all for goodness sake….lol it should cook for at least 4 hours i know there are ways to shorten and thats fine when you are in a pinch but if you want to feel like you are in italy with a nice glass of wine and beautiful music by all means let it simmer all day- bacon is fine or any similar thick fatty ham type product but nothing like maple smoked or anything that would throw the flavor off or offer any sweetness – despite what people have been led to believe a ragu, marinara, gravy whatever you want to call it should never never never never be sweet if it is then save yourself time and open a jar which i could never bring myself to do it is not the same- as an italian you can make a quick marinara version in less than a half hour and it taste so much better- for my meat I use pancetta or in a pinch a bacon type product- veal or pork and beef- as far as the pasta it should be something that the sauce will stick to- another trick is dont rinse your pasta so the starchs will help the sauce stick and if you are making just enough for dinner you should actually add the pasta right into the pot with the bolognese and it will all stick together- i make huge batches because my daughter and husband will actually just put it in a bowl and eat it without the pasta before and after dinner- crazy……. i would not be able to write own the recipe i just measure as i go- the color also depends on the wine you use- surprisingly some italians use red wine but that will deepen the color as well i use dry white hence allowing the color to stay more orange in color……. i think the original recipe seems fine sorry i didnt try it i just make my own but your ingredients in nature seem fine- the picture does look dark but that could be many reasons. Unfortunately some people will love it and some wont its what happens when you put yourself out there in the public but shrug it off and keep doing what you do- its awesome! 🙂 Thanks for the comments. The picture makes the ragù look much darker than it actually is. As I said, I didn’t want to admit this to cottagerswife. I cooked your recipe exactly as described and fell in love with it. Its so much better than the sugar laden jarred stuff we buy here in Australia. Now that im off interstate for a few days im cooking a bumper batch to see my wife and baby girl through. Great work with the site, when will we see some new recipes? :p Cheers. Ivan’s here, Italian who lives in Fiji since too many year now. 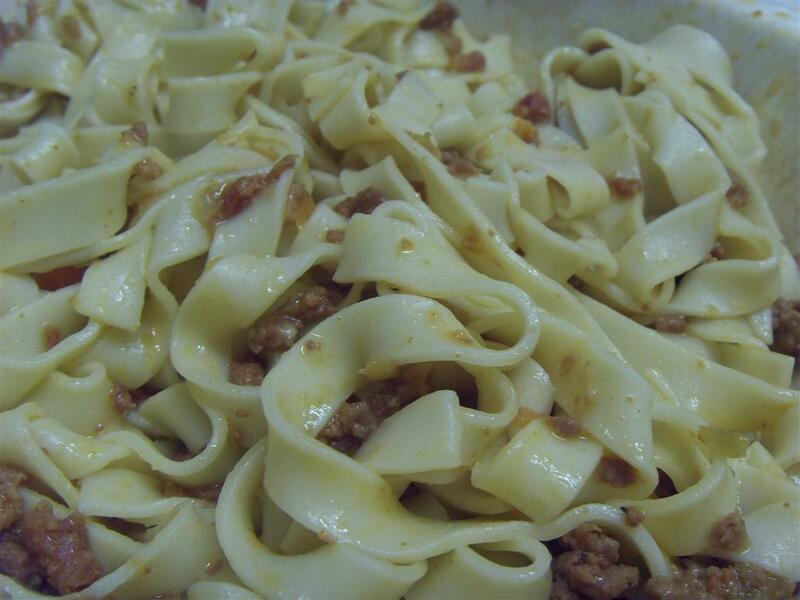 I’ve just posted my very own recipe of the ragu’ alla bolognese. My recipe comes from years looking at my mum and grand ma and it is not too distant from yours. Just a question.. why not spaghetti? all the best and keep cooking good food! in deed you are right, I myself am not a spaghetti lover that much but my wife, well that is a different story. In the end, as you say, we are the cook we grew to be. great blog anyway, i’ll talk to you at our next recipe. Yes that is correct, no garlic. Genuine Italian food generally contains much less garlic than people imagine. I think its garlicky reputation probably comes from Italian-American recipes rather than from native Italian ones. Fond is indeed a sort of stock but its made from the scrapings at the bottom of the pan.So it’s very concentrated. A sort of gravy base I suppose. Here in europe you can buy it as a liquid in pots in any good supermarket. Oh, I see now. That would be something like Bisto gravy browning in the UK then. If you check out the recipe for Bari style Ragu you’ll see that the scrapings from the bottom of the pan are an integral part of the recipe. Great site BTW !! Have tried this great recept a few times now. Bacon is a good subsitute but i found that dried raw ham (any variaty just as long as it’s not smoked) gives a very nice result.Also (probably a cardinal sin but still….) I added about 100ml of beef fond (fond! NOT bouillon )it was absolutly increadable, an enormous taste explosion!! :-)Same idea i suppose as fatdogs chicken liver …it really brings out the meatyness! Anyway great job and keep em coming!!! Hi Patrick. Thanks for the feedback. The raw ham option sound like a good idea if you can afford it. I’m ashamed to admit that I’ve no idea what fond is though. Is it a kind of stock concentrate? HI: I followed the recipie as closely as possible converting the metric portions to US weights & measures. I cooked the ragu for the required four hours adding a tablespoon of sugar at hour three. I used ground beef and white wine ( a riesling from the bottom shelf of our local supermarket, I do not know wines!) The color was perfect, and the taste, wonderful. I served it with fresh fetticucine and grated parmigino regiano (sp?). Had the same dish in Rome last week and this was equally as good!! Thanks for the feedback Patrick. I’m glad you enjoyed it. Im at it again. Not drinking too much wine this time! Have now done probably a 17 variations of the Ragu/ bolongaise theme, borrowing from various recipes to come up with my own final all time best formula. Some disasters (not too bad), one incredible outcome – and I have had ragu from all corners of this globe including some of the ‘best’ from Italy. The only problem is that Im still trying to unravel what I did – I will say what I did was so outlandish im embarressed to put it in print until re-tested. I have been on mission to make many ragus – afterI included a ragu story/tale/heated argument in my youth play CIAO CINDERELLA. This looks delicious and will try it. Last night made a ragu with sweet Italian sausage (from TASTES OF ITALIA) and it was a winner. I do agree that the slow simmering really melds the flavors into somethingwonderfull complex – and attractive. Glad to have found this blog! I reckon your version will turn out fine. What’s 30% between friends? oh by the way. Im an aussie in South Africe via Indonesia. cheers. Tremendous websit – thrilled to have found it. Currently do the Ragu. Already a couple key errors in the measurements with a result of too much indulgance in white wine and bad math skills. basically 30% too much of the carrot/onion/celery. I had 500gms of mince beef to which I combined 450gms of Pork loin (beaten with a tenderiser and cubed) and 100gms of bacon. I would have prefferred neck of pork- under slow simmered it would be delightful. I prepared half of the pork cubed and half slice in the chinese style to see which breaks down better. the recipe is not far from Hester Bleumanthuels (did I spell his name right?) recipe of the same. will report back on the outcome but suspect the overdose of veg will make for a more intense flavour than required. I was surprised that you said the Italian food in Bulgaria is not too good. Since it is somewhat close geographically. But sure, the two cultures are very different and use different types of foods and ingredients. Hi Georgi, nice to hear from you. Pancetta is a type of italian dry cured bacon. If you can’t find it then you can use bacon (preferably unsmoked) or minced pork (belly or something similar). I look forward to hearing how you get on. I’ll eat it with spaghetti if I want to. This nonsensical fetish about “authenticity” helps no one. If it tastes good, eat it. It’s food. Celebrate. It’s not to do with authenticity actually. It is all to do with what tastes best. Spaghetti is so thin and round that it does not allow the meat and sauce to grip to it. If it tasted better with Spaghetti then that is what they would probably eat it with, but it doesn’t so they don’t. I’m sure Speckwürfel is a very acceptable substitution. Am I right in thinking that the rough English translation is ‘bacon bits’ ? You could even used minced belly pork if that’s easier to find. I was unable to obtain pancetta – Interspar said they used to stock it- and I had to substitute Speckwürfel from Austria. I imagine Interspar don’t stock pancetta as there is a ‘similar’ product produced in Austria. That said I followed the remainder of the recipe and we were pleased with the outcome. It tasted very well and looked much like your illustration. I must find a source for pancetta and try it again. Can’t you use becon ? I hang my head in shame though ……….. it didn’t seem right serving it with tagliatelle!!!!! I thought this recipe was very very good! Nothing like the bolognaise I usually make. The flavour definately came from the meat and the flavour was much more intense than I had expected. You must be my most loyal visitor 🙂 It really is a great recipe. I look forward to hearing how you got on. Thanks for taking the time to comment, it’s nice to receive such detailed feedback. The flavour comes primarily from the meat. There are many version of Ragu in Italy. This recipe is specifically for the version commonly served in Bologna and deposited in the archive of Accademia Italiana della Cucina. The Bolognese version of ragu shouldn’t have a strong tomato taste. The tomatoes should just add an extra ‘note’. As I mentioned in the article, this recipe is not very similar to the ‘spag bog’ we are used to in the UK or to the ‘red sauce’ they are used to in the USA. One thing I forgot to mention, however, is the quantities of tomato puree are for triple concentrated. If you use double concentrated you can increase the quantity. I’ve amended the recipe to make that clear. As you can see from the photo, mine came out a quite dark, rich colour. I’m not sure what went wrong with yours. How long did you cook it for? Anyway, thanks again for the feedback and I’m sorry the recipe didn’t turn out as you expected. I set out to make this, with a promise that I would stick to the recipe, even though I wasn’t sure where the flavour would come from. In the end, I couldn’t do it. With just 30 gms of the tomato puree and so much milk (about 3/4 of a cup?) my sauce came out an orange-tinged grey tone. This can’t be right. It looked very unappetizing and had no tomato flavour. I ended up adding a big can of drained/pureed/strained plum tomatoes and a full can of tomato paste. Then it looked more like your photo and tasted more like the RB we enjoyed so much on the Ligurian coast last summer. I thought I would let you know so you can double check the quantities you listed. 30 grams of concentrated tomato puree proved to be a bit less than 4 Tbsp by my scale. Now we know what the real Bolognese is to be like. Thanks. http://www.bentpage.wordpress.com. I was looking for inspiration and found it with this recipe. It sounds super and I’ll try it when Dietlinde returns from the Spa and post another comment then. Unexpectedly I also found the link to my web page. Many thanks for that.